As with most MMA products, boxing glove brands are a dime a dozen, and each brand represents a quality of its own. While there are a lot of affordable boxing gloves, those made with high-end materials are often the most recommended, so it’s not really surprising why some people opt for some of the most expensive boxing gloves on the market. The boxing gloves from this list range anywhere from $100 to over $350. Regardless of the type of boxing gloves, whether Velcro, lace-up, vinyl or leathered, one thing is certain – do not buy underpriced low quality boxing gloves if you plan on putting in serious work. Picking high quality boxing gloves is important in preserving your wrists and fists. Alternatively, good boxing gloves don't have to be super expensive either. That said, below are some of the most expensive (and high quality) boxing gloves that you might want to consider if you are in the market for high-end gloves. Each boxing glove is summarized with pros and cons as well as an aggregate star rating out of 5 stars based on user reviews. If you just want to know ahead of time which one of the gloves we like the most, look at our pick below before browsing to the other gloves. Here is our pick for the top glove on the list. 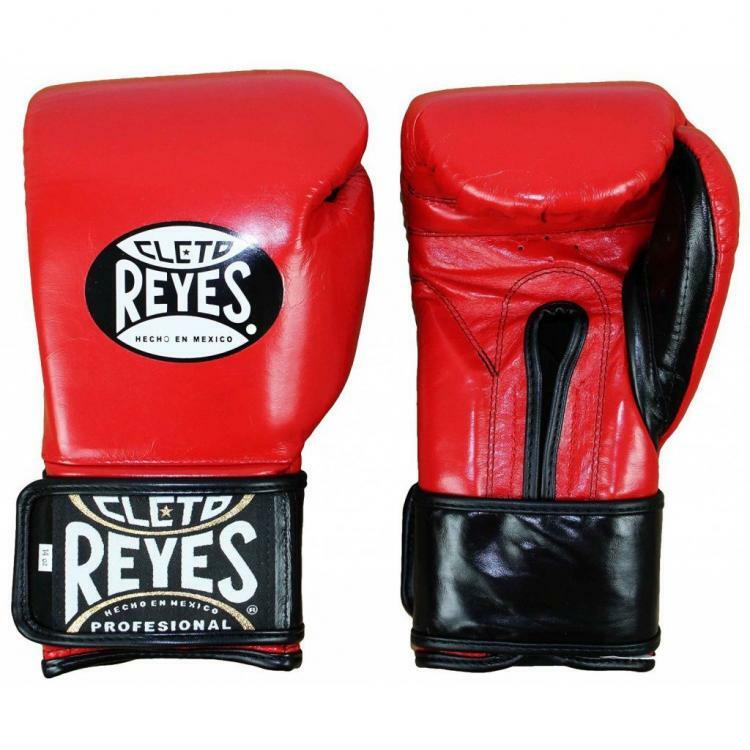 Cleto Reyes gloves are known for its minimal padding and colorful designs. But if you like putting the hurt on your sparring partner, grab nothing than a pair of Cleto Reyes Hook and Loop Training Gloves. Despite having a minimalist padding design, the gloves can absorb hard hits, which allow wearers to throw punches without having to worry about injuring themselves or getting sore. The incredible finger and thumb design also ensure wearers of added support to reduce the chances of injury. Amateurs and professional boxers are both known to prefer Cleto Reyes gloves because they are moisture resistant, eluding the chances of water damage or mold build up. Those who have gotten themselves a pair of Winning Training boxing gloves often remark of how these gloves are very much like a pillow – soft and comfy. You really need this kind of support in boxing to protect your wrists and hands so you can hold long training sessions. Winning gloves are made in Japan and are known to absorb force with each and every punch. While generally preferred as competition gloves, these Winning Training Boxing Gloves are designed for sparring especially for long periods. These gloves are designed to follow the contour of the hands, which will please most boxers whether professional or amateurs. While most players prefer gloves with less padding, Winning gloves are the opposite, but will ensure comfort and protection nonetheless. This is the most expensive boxing glove on this list, coming in at over $300. These pair of gloves, also from Winning, is not only a hit in the boxing world – MMA fighters also love the Winning Velcro gloves. Like the brand’s training gloves above, these kind are soft and inviting, and are fully broken in. It’s also great because you can fully open your hand when you put them on. As opposed to its laced up counterpart, the Winning Velcro Training Boxing gloves are designed with Velcro, which means you can save time when wearing them on. Wearers have also praised these gloves because you can wear them every day for years and they would still look great. Whether you’re an amateur or already a pro, these pair of gloves is easily a standout because of how different it feels. This is another pair of Cleto Reyes gloves but this one has two additional inches of padding in the knuckle area. It adds impact absorption and protection and offers a far more comfortable experience during training. Its closure is also hook and loop, and its leather strap offers extraordinary support for the wrists. To avoid strains, its thumb compartment comes with holes in it for ventilation and beginners will love its gloves attached thumb feature. A pair of gloves perfect for training, they come red and black color variations and are available in both 16oz and 12oz sizes. Hayabusa Boxing gloves are a staple among MMA fighters, which has garnered an incredible reputation as one of the most trusted brands of boxing gloves. Most boxing glove brands have decided to maintain traditional designs, but Hayabusa has been making innovative designs and is marketing gloves with unique features. The Hayabusa Tokushu Regenesis Boxing Gloves for one has incredible shock absorbency, and although not as soft as Winning boxing gloves, they are comfortable to wear and are pretty much broken in. the dual straps also work as added protection to the wrists, and many have commented on how you’ll never sore your wrist when wearing these gloves. It’s not exactly the first choice for noob fighters and may not be the perfect glove for sparring, but these, when worn, may surprise you, plus it looks unique, too! As its name suggests, these pair of boxing gloves come with gel padding for extra protection. Title Gel World Boxing Gloves are impeccably designed with multi-layer foam padding and gel lined padding to boot. It ensures users of impact resistance, so soreness is eliminated and the risk of acquiring injury is lessened. The Title Gel World Boxing Gloves feel good to wear and they are aesthetically designed as well. It has a wraparound wrist strap with a hook and loop design so you won’t have to worry about tying laces up or getting them knotted. Keep in mind, you usually have to break in a pair of gloves a little before they get the comfortable feel, and this pair may require extra work to do so. Title’s exclusive gel enforced lining feature makes the Intense Training/Sparring gloves the perfect buddy for practice. The wool-like texture on its interior will mold to your hand after weeks of using. With its 360-degree wraparound hook and loop closure, these gloves will provide excellent wrist support. Like most of Title’s products, these gloves aren’t likely to break under any normal circumstances. It is made of high-quality full-grain leather that makes it a tough gear for combat. At the same time, its gel lining and optimized foam padding provide comfort to the wearer and will absorb the greatest of impacts. Because of its hook and loop straps, it means the glove won’t move around when using it. People looking to buy a pair of boxing gloves may be left overwhelmed at all of the choices available in the market. Budget constraints are always a setback, but what about people who have enough resources to invest in a great pair of gloves? When it comes to buying expensive boxing gloves, most people would think they could just do so without much of a thought. However, even for the richest, it still boils down to support, protection, and comfort. The type of glove should also be considered depending on where it’s going to be used. If you’re a beginner, go for a pair of fitness or training gloves. Sparring matches require sparring gloves, obviously, while competition gloves are always going to be the most expensive and should be used according to your weight class. Regardless, the huge market for boxing gloves means there’s a boxing glove for every kind of fighter out there, so whether you have dreams to be the next Pacquiao or the next Mayweather, above are some interesting choices. Good luck! We have also reviewed some beginner's boxing gloves and muay thai gloves that are on the cheaper end. So if you are interested in those, be sure to check it out. Also, be sure to check out our article detailing exactly what else you need for boxing classes.